For 16 years, the SHAPE Women’s Half Marathon has brought together thousands of women of all ages and backgrounds for a day of fun, fitness, and camaraderie in NYC. 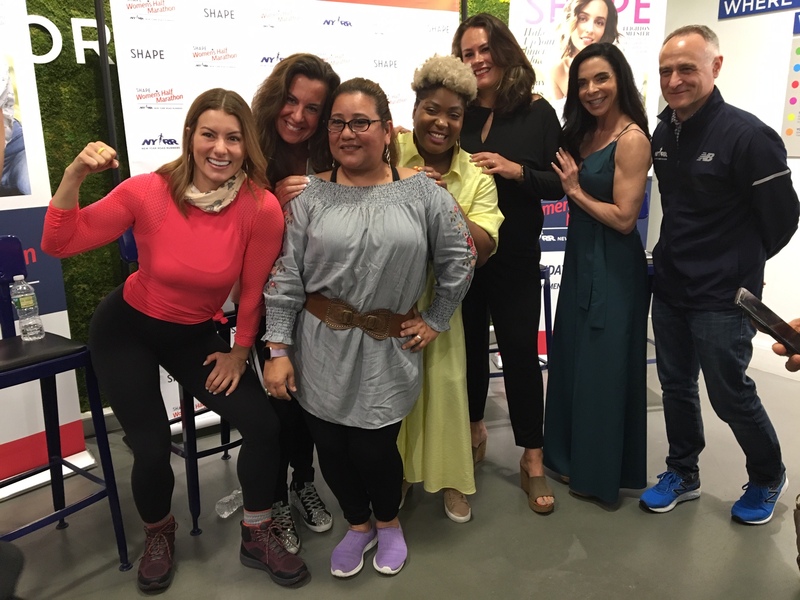 Race weekend kicked off this year on Saturday at the NYRR RUNCENTER as SHAPE and New York Road Runners hosted an inspiring and informative Women Run the World™ panel. Moderator and panelist Jen Widerstrom, a trainer on The Biggest Loser and the consulting fitness director of SHAPE, led a lively and motivating discussion centering on female leadership and empowerment. She was joined on the panel by four other women from various fields who are making a difference in their industries and communities: Elizabeth Goodman Artis, editor-in-chief of SHAPE; Janine Delaney, psychologist and fitness expert, Rhonda Vetere, a C-suite executive and global leader in technology, and Tiff McFierce, DJ (she kept energy high at the finish line on race day and also gave us some insight into her preparation before the race) and wellness advocate. For Goodman Artis, the key to facing challenges is a willingness to change. “Whatever your goal is, if you’re struggling to get there and you feel like it’s not working, you’ve got to pivot—to say, OK, what’s going to work?” said Goodman Artis. And on race day, women did indeed run the world as more than 6,000 women—including many first-timers—raced two loops of Central Park in glorious spring weather, with McFierce welcoming them at the finish line with some motivational tunes. Widerstrom asked the panelists where they found the courage to take on new challenges—whether it’s starting a running program or embarking on a new career. For McFierce, the pursuit of success is rooted in being aligned with her purpose. “When that happens, you can say no to things that just don’t align with you anymore,” she said. Goodman Artis urged the audience to reward themselves along their journey toward their goal. The reward doesn’t have to be extravagant—it can be something as seemingly insignificant as a cup of tea. “Have that small moment of joy and happiness—just take a moment and focus on it and be present in that moment,” she said. While our SHAPE runners got 13.1 miles of exercise in on race day, Delaney believes she succeeds because she makes sure to fit in exercise no matter how busy she gets. “My friends tell me I can’t be that busy if I have time to work out,” she said, “but the reason I make the time to do it is that it puts me in my zone”—a place of productivity and calm. The panelists wrapped up by urging the audience to “run the world” in ways that have meaning to them.